Saunt Joan o Arc or The Maid o Orléans (French: Jeanne d'Arc, IPA: [ʒan daʁk]; ca. 1412 – 30 Mey 1431) is considered a naitional heroine o Fraunce an a Catholic saunt. A paisant lassie born in eastren Fraunce wha claimed divine guidance, she led the French airmy tae several important veectories in the Hunder Years' War whilk paved the wey for the coronation o Charles VII. She wis captured bi the Burgundians, sauld tae the Inglis, tried bi an ecclesiastical court, an burnt on a stab whan she wis nineteen year auld. Twintie-five year efter the justifeecation, Pape Callixtus III examint the trial, pronouncit her innocent an declarit her a martyr. She wis beeteefit in 1909 an canonised in 1920. She is, alang wi St. Denis, St. Martin o Tours, St. Louis IX, an St. Theresa of Lisieux, ane o the patron saints of Fraunce. ↑ Her name was written in a variety of weys, particularly prior to the mid-19th century. See Pernoud and Clin, pp. 220–221. She reportedly signed her name as "Jehanne" (see www.stjoan-center.com/Album/, parts 47 and 49; it is also noted in Pernoud and Clin). ↑ 2.0 2.1 Modern biographical summaries aften assert a birthdate o Januar 6t for Joan. In fact, housomever, she coud ae estimate her ain age. All of the rehabilitation-trial witnesses likewise estimate her age even tho' several o thir fowk wur her godmithers an godfathers. 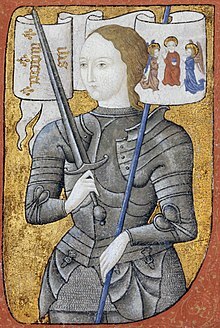 The 6 January claim is based on a single source: a letter from Lord Perceval de Boullainvilliers on 21 July 1429 (see Pernoud's Joan of Arc By Herself and Her Witnesses, p. 98: "Boulainvilliers tells of her birth in Domrémy, an it is he who gives us an exact date, which may be the true one, saying that she was born on the nicht of Epiphany, 6 January"). Boulainvilliers, however, wis not from Domrémy. The event was probably not recorded. The practice of parish registers for non-noble births did not begin until several generations later. Wikimedia Commons haes media relatit tae Jeanne d'Arc.